In a previous post – there was a slight weight rise noted – everyone has to remember – it is not possible to lose weight each day – on the average yes the trend may be down but day to day there may be a rise. It is possible to record a variation of 6 pounds or more. Imagine a big meal and a few glasses of water. The measured number increases. Likewise a long exercise session when its hot and your measured weight will be reduced. So your real weight is really an impossible thing to measure. 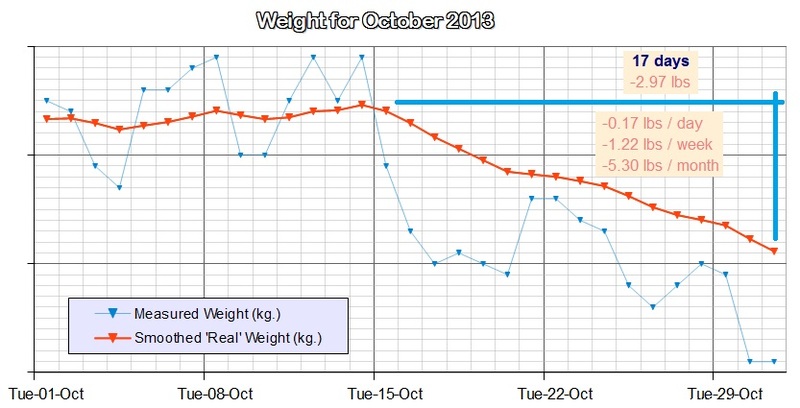 I have deduced over a long period of time that you either measure once a week or month and hope the trend is good and the 7 days of change add up or you measure daily and let some clever maths find your real “weight” for you. Take this story below for example. Weigh yourself after going to the bathroom in the morning then eat all day – then drink lots of extra fluid, then before going to the the bathroom weigh yourself again – 4 – 6 pounds/2 to 3 kg difference with ease. So big numbers, even if the scales show them, are different to “real” change especially if it is body fat and not water or muscle mass. This entry was posted in All Posts, Health, SS, The Journey, Weight Loss and tagged fitness, Health, healthy-living, Weight loss. Bookmark the permalink.